What is the prognosis of a cavity? Dental cavities are holes in teeth caused by tooth decay. Cavities are also referred to as caries. Teeth are in an environment of constant acid attack that strips the teeth of important minerals and breaks the teeth down. While this attack is constantly occurring, minerals are also be constantly replenished through mineral-rich saliva and fluoridated water and toothpaste. In addition to fluoride, calcium and phosphate also help to remineralize enamel. When the demineralization starts and is confined to the outermost layer of enamel, it is called a microcavity, or incipient cavity. These types of cavities rarely need anything more than very conservative treatment. Only when the cavity breaks through the enamel layer and into the dentin does it really threaten the tooth. So when these microcavities are detected, it is best to try a remineralization protocol to see if they can be reversed instead of jumping to a filling right away. A dentist will help in determining the most effective conservative treatment for these early cavities. The dentist's goal is to achieve a healthy balance between prevention and restoration. It is a balance between being proactive and reactive. The dentist doesn't want to be so proactive that he is recommending things that don't need to be done -- preventing problems that realistically never would have occurred. But he doesn't want to be so reactive that he simply watches small problems become big problems. One mistake people often make is waiting for pain to dictate the timing of treatment. Once a tooth starts hurting, it is often too late for remineralization or a small filling. Pain usually indicates a need for root canal treatment, a crown, or tooth extraction. There is some variability in how dentists will treat microcavities and when they determine a filling is necessary. Some people are more prone to caries than others. Analyzing one's history of cavities, current diet, and oral hygiene may lead the dentist to be more aggressive or more conservative with his recommendations. This is why it is important that each person finds a dentist that echoes his or her own philosophy regarding aggressive versus conservative dental treatment. Regardless of the dentist, regular returns to the dentist are key to being conservative so the cavity can be monitored and treated before it grows too much. Small cavities can become root canals within a year under the right circumstances. As a cavity grows, more tooth structure is lost. Lost tooth structure leads to a greater likelihood of fractured teeth, recurrent decay, and tooth loss. When possible, one is always better off getting a small filling than ending up with a large filling, a root canal, or a crown. What are Cavities Between Teeth (Interproximal Cavities)? Cavities in between teeth are commonly referred to as interproximal cavities or decay by your general dentist. Cavities form when there is breakdown of the outer, calcified enamel of the tooth by bacteria commonly found in the human mouth. The bacteria stick to the teeth, embedded in a hard substance called dental plaque or calculus, which deposits on your teeth. Plaque often forms in between the teeth due to the inability of toothbrushes to properly clean these tough-to-reach areas of the mouth. These bacteria break down sugars and carbohydrates, resulting in an acid attack that breaks down the enamel of the tooth and causes the cavities. Two main factors contribute to tooth decay -- bacteria in the mouth and a diet high in sugar and starch. There are over 500 different types of bacteria that are normally present in the mouth. These bacteria combine with food and saliva to form a sticky substance called plaque that attaches to teeth. Foods rich in starches add to the stickiness of the plaque, which begins to get hard if it remains on the teeth after a couple of days and turns into tartar or calculus. Bacteria in the plaque convert sugar into acid that dissolves the tooth structure, causing holes, or cavities. Because of these two contributing factors, dental caries have been described as a "dietobacterial" disease. The parts of teeth that are most vulnerable to tooth decay are areas where plaque can accumulate most easily. Plaque tends to settle into the pits and fissures in the tops of teeth, into the areas in between the teeth, and next to the gum line. Where there is plaque, there are bacteria and acid, and eventually destruction of the tooth surface. The cavity starts in the outer layer of the tooth (enamel) and as it gets deeper, penetrates into the softer inner layer of the tooth (dentin). Typically, it isn't until the decay reaches the dentin that a person will start to notice signs and symptoms of the cavity. Tooth size and shape: Small teeth with numerous deep pits and grooves will be more vulnerable to cavity formation than large teeth with fewer and shallower grooves. The grooves and pits provide areas for plaque to build up and are difficult to brush thoroughly. Thickness of enamel: Enamel is the tooth's main defense against cavities, so the more of it a person has, the longer it will take for a cavity to break through to the inside of the tooth. Tooth position and bite: Crooked, overlapped teeth provide more areas for plaque to accumulate and are harder to keep clean. Many problems can occur if the bite is poorly aligned. Poor alignment of the bite can cause the enamel on certain teeth to wear down rapidly, leaving soft dentin exposed. Orthodontics is a great cavity-prevention measure because straight teeth that are in a proper bite position tend to stay cleaner and more cavity-free throughout a person's lifetime. Tooth eruption time and sequence: People who get their permanent teeth earlier in life are at greater risk for cavities because oral hygiene practices may not be developed yet. When a cavity advances deep into the tooth, it may produce increased sensitivity to foods that are cold, hot, or sweet. But not all cavities will cause a toothache. If they are small or progressing slowly, they may only be detected by a dentist before they cause pain. Cavities on front teeth are easiest for a person to see, and they will be visible as a light or dark brown spot. The brown spot is tooth structure that has become soft due to the acid attack from bacteria. Generally, light brown represents a fast-growing cavity and dark brown represents a slower-growing cavity. If the cavity gets large enough, part of the affected tooth may break off and leave a hole. A dentist can detect a cavity by using a sharp instrument to feel tooth structure that has been softened by tooth decay. If a cavity forms in between the teeth, it may only be visible on an X-ray. Other diagnostic tools that are used to detect cavities include ultrasound, fluorescence, or fiberoptic transillumination. Regular dental exams are recommended so cavities can be diagnosed when they are small cavities (incipient caries or microcavities) instead of waiting until they grow large enough to produce pain and require more extensive treatment. There are three things to consider in the treatment of dental cavities: prevention, remineralization, and restoration. Prevention: A greater emphasis on preventive dentistry has helped reduce the incidence of premature tooth loss. Since we can't eliminate the bacteria that are in the mouth, limiting the amount and frequency of sugars and starches in our diet is the easiest way to prevent dental caries. Maintaining a healthy diet to prevent tooth decay is very important in children and toddlers both for baby teeth and as they start to get their adult teeth. Sugary soft drinks and juices are especially harmful to the teeth. When possible, sweeteners such as sucralose should be substituted for sucrose because they can't be digested by bacteria. Xylitol is another sugar substitute that actually kills bacteria, so chewing xylitol gum after meals will greatly reduce the incidence of cavities. Plaque can be removed from the outside of teeth by brushing and from in between the teeth with dental floss. Use of a mouthwash also helps by limiting the number of harmful bacteria in the mouth. A dentist will often suggest placing plastic sealants in the pits and grooves of teeth in children to protect them from decay. Visiting the dentist regularly will help prevent cavities from forming or catch them when they're small. Remineralization: Shallow cavities can be reversed when they are treated with a substance that contains fluoride or calcium. This "rehardening" process is known as tooth remineralization. Fluoride makes the enamel more resistant to cavities and can be applied to teeth through fluoride toothpastes, supplements, dental office fluoride treatments and varnishes, and fluoridated water. The amount of fluoride exposure must be carefully controlled though, because high levels can be toxic. Restoration: When a cavity is too large to be remineralized, it must be restored. If the cavity is still small, it can be restored with a filling made of composite or silver amalgam. If a large part of the tooth is decayed, it will need to be covered with a crown. Crowns are typically made of gold, porcelain, or zirconium. If the cavity has extended to the center of the tooth and infected the nerve, a root canal will have to be performed. Sometimes, the cavity infects a majority of the tooth surface and the tooth has to be extracted. 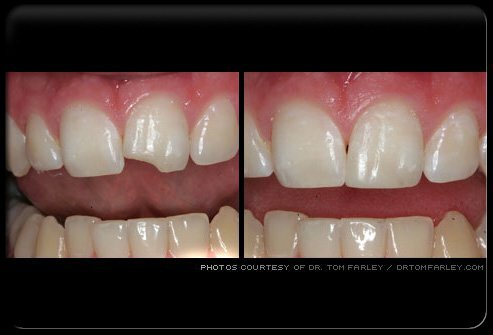 Areas where teeth have been extracted can usually be restored with dental implants or bridges. Baby teeth that get cavities may be restored with a filling, a stainless steel crown, extraction, or pulpotomy. It is very important that kids get their baby teeth treated so that abscesses don't form and oral disease doesn't keep increasing into adulthood. Hormonal and bacterial quantity changes during pregnancy put pregnant women at greater risk for gingivitis and periodontal disease. Therefore, it is very important that pregnant women continue to get regular dental cleanings during pregnancy. Pregnant women have generally been counseled to avoid elective dental treatment during pregnancy unless they are experiencing an emergency like pain or infection. In this case, the second trimester is the best time for treatment to keep the expectant mother as comfortable as possible. Local anesthetics and other materials used during dental treatment don't increase risk to the fetus, but untreated oral disease has been shown to lead to adverse pregnancy outcomes. If X-rays are necessary, a protective apron will be placed over the woman's stomach and thyroid. If antibiotics are necessary, tetracycline should be avoided because it will cause staining in the baby's developing teeth. CAMBRA stands for caries management by risk assessment. It is a method for assessing a person's risk for developing dental cavities and making dental treatment decisions and recommendations based on the patient's caries risk. The dentist performing CAMBRA will perform tests for oral bacteria and take X-rays. He will then determine the patient's level of caries risk by analyzing caries history, current caries condition, dietary habits, hygiene habits, prescription medications, salivary flow, and medical conditions. Treatment will then be tailored to the patient based on managing the risk factors through behavioral, chemical, and minimally invasive procedures. No two cavities are the same because no two people are the same. Thus, diagnosis and treatment planning requires risk assessment in addition to caries detection. Dental cavities are a preventable and treatable disease. By making simple changes in diet and hygiene, one can minimize the risk of developing caries. If a person has been diagnosed as being at high risk for dental cavities, the dentist may prescribe a prescription toothpaste or fluoride varnish to protect the restored teeth from getting recurrent caries and prevent new ones from forming. Consistent evaluation and follow-up with a licensed dentist combined with attentive oral hygiene will help a person affected by dental cavities to have a very favorable prognosis. "For the dental patient: oral health during pregnancy." Journal of the American Dental Association 142.5 (2011): 574. "Tooth Decay." American Dental Association. <http://www.ada.org/3031.aspx?currentTab=1#jada>. Brambilla, Eugenio, et al. "Caries prevention during pregnancy: results of a 30-month study." Journal of the American Dental Association 129.7 (1998): 871-877. Diniz, Michele B., et al. "The performance of conventional and fluorescence-based methods for occlusal caries detection: an in vivo study with histologic validation." Journal of the American Dental Association 143.4 (2012): 339-350. Michalowicz, Bryan S., et al. "Examining the safety of dental treatment in pregnant women." Journal of the American Dental Association 139.6 (2008): 685-695. Zero, Domenick T., et al. "The biology, prevention, diagnosis and treatment of dental caries: scientific advances in the United States." Journal of the American Dental Association 140.Suppl 1 (2009): 25S-34S. Are you afraid to undergo treatment for cavities during pregnancy? Do you or your child get lots of cavities or have several fillings? Please discuss treatment, including sealants. What steps do you take to prevent cavities? Dental bridges consist of two crowns for the teeth on either side of a gap and a false tooth in between. Types of bridges include traditional bridges (made of porcelain), cantilever bridges, and Maryland bonded bridges (made of plastic). Bridges can last from five to 15 years, or longer. Teething in babies typically starts between 4 and 10 months of age. Symptoms and signs of cutting teeth include rash, drooling, decreased sleeping, fussiness, bringing the hands to the mouth, and rubbing the cheek or ear. Acetaminophen and ibuprofen may be used to treat teething pain.